One of UCF’s own was honored recently with an El Josco Award for her contributions to education. The Puerto Rican Chamber of Commerce of Central Florida honored Cyndia Muñiz, assistant director for Multicultural Academic & Support Services, with the award, which is named after a character in contemporary Puerto Rican literature written by Abelardo Díaz Alfaro. El Josco (The Ox) represents those who stand up to challenges and adversity to overcome at the end, and someone who perseveres and fights for what he or she believes in. Muñiz helps connect students with multiple resources and shares advice about the journey, especially with first-generation students. They often connect because she walked the path herself earning a bachelor’s and multiple advanced degrees. Her efforts to help students succeed at UCF and beyond have been recognized by several organizations that have recognized her with multiple awards. The Puerto Rican Chamber said this year’s winners “help improve the quality of life for all of us in Central Florida. These citizens who make a positive impact in our way of life should be recognized and celebrated,” according to the announcement. 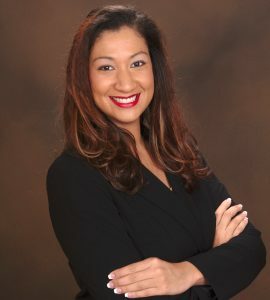 Muñiz has earned multiple advanced degrees including a master’s degree in sociology from St. John’s University and a doctorate degree in educational leadership and administration from UCF. When she isn’t helping students at the university she is volunteering her time with multiple organizations, including the Hispanic Chamber of Commerce of Metro Orlando’s Young Professionals Program and the Hispanic Heritage Scholarship Fund of Metro Orlando. Aside from the El Josco Award, she has received The Women’s Achievement Award for her contributions to diversity and was also named one of the Orlando Business Journal’s 40 under 40 and Women to Watch. Additionally, she was selected a finalist for the Hispanic Chamber’s 2015 Don Quijote Award and La Prensa Newspaper’s Exceptional Women Award. This past year Dr. Muñiz also founded the UCF Latino Faculty & Staff Association, or LaFaSA,, to raise awareness of and advocate for the needs of Latino employees and students at the university. One of the organization’s goals is offering mentors for new Latino faculty and staff who could benefit from experienced colleagues’ advice on navigating the university and understanding its culture.